Michael J. Pontarolo is a principal in the Spokane/Seattle Law Firm of Delay, Curran, Thompson, Pontarolo & Walker, P. S. A 1973 graduate of Gonzaga School of Law, his legal emphasis is in Worker’s Compensation and Social Security Disability Law. He taught at his Alma Mater as an Adjunct Professor of Worker’s Compensation for over 20 years. He was elected and served as President of Spokane County Bar Association, Vice President – East of the Washington State Trial Lawyers and Governor on the Washington State Bar Association’s Board of Governors (2003-2006). Currently he is a member of the American Bar Association, American Association for Justice fka Association of Trial Lawyers of America and the Washington Association for Justice fka Washington State Trial Lawyers Association and Spokane County Bar Association. 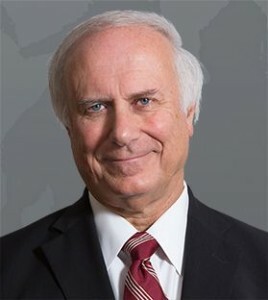 He has held Chair and Membership positions on state and local bar committees, including the Washington State Bar Association, Rules of Professional Conduct and Character and Fitness Committees. He is also currently an Adjunct Investigative Counsel and Special Disciplinary Counsel for the Washington State Bar, and Attorney Member to the Washington State Commission on Judicial Conduct serving as Chair 2015-2016. In 2009 he was awarded the Spokane County Bar Association Smithmoore P. Meyers Professionalism Award. Mr. Pontarolo is listed in Best Lawyers in America by U.S. News and World Report and holds a rating of Preeminent with Martindale-Hubbell, a US attorney rating service.